When developing games and simulations, you may want your users to be able to influence assets that are active in a physics simulation. In this article, you learn how to develop a Unity* 3D scene that has touch gestures configured to alter the physics characteristics of assets in a scene, including position, scale, mass, and velocity. You can use these alterations to improve a simulation's user interface (UI) or to make the scene more aesthetically interesting. 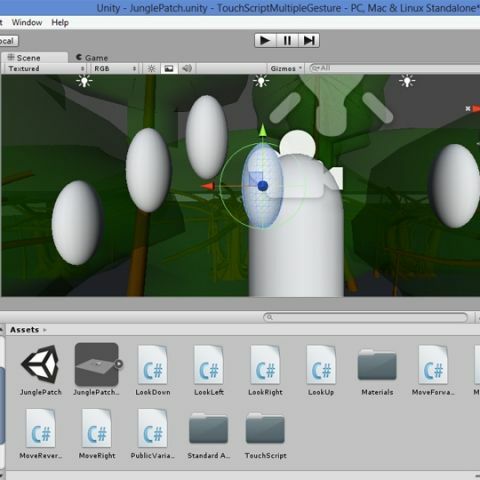 This example shows Unity 3D running on Windows* 8 as a viable platform for manipulating physics characteristics via touch gestures in games and simulations. I configured the geometry for this scene in Autodesk 3ds Max*. I applied a wave modifier and a bend modifier to a surface, with a green turret at one end of the surface. I exported this scene from Autodesk 3ds Max in FBX format, and then imported it into Unity 3D (see Figure 1). The surface altered with the bend and wave modifiers instigate motion for other assets added to the scene at runtime. Note: Be sure that the geometry you import from third-party applications does not contain such sharp and numerous surface features that the Unity 3D physics engine is overly burdened or simply does not function. Certain development environments may dictate a maximum number of vertices and triangles allowed per imported asset. The assets in this example scene do not use any materials, shaders, or textures, but when such assets are used, you must consider their impact on your targeted deployment platform resources. Also imported with the "visible at runtime" geometry were spheres that are "invisible at runtime." I placed these spheres above the valleys of the wave (see Figure 2). With the above script implemented, the wavy base geometry fills with rigid-body physics spheres that disappear after 60 seconds (note the Destroy function call in the penultimate line of the script). You can alter and balance the 60 seconds to spawned sphere destruction feature based on the capabilities of your target platform and the scene aesthetics you desire. The turret at the end of the geometry is configured to shoot capsules at the sphere if they get too close. This turret is not configured to lead the spheres and is usually off target (see Figure 3). The spawned spheres roll to the valley of the platform, and the capsules fired from the green turret push them to the back wall. The most noticeable impact to performance in this Unity 3D scene comes from having a large number of turret capsules and spawned spheres in active view at the same time. Note that in the onPanStateChanged function, the Vector3 variable local uses all three axes, where in other graphical UI-focused simulations, I used only the x- and y-axes. You can adjust this functionality and other attributes, including panning speed, according to your preferences. When panning the back wall to protect the spawned spheres from turret capsules, it's somewhat difficult to place the back wall in an ideal position. You would need to modify the Vector3 variable local in a dedicated script for the back wall asset to enable a turret protection feature. The GenericTap script performs all rigid-body modification in the onTap function and does not use the Update function. The onTap function increases the scale of the sphere tapped by a factor of 2 each time a user taps the sphere. I added this functionality to keep track of the sphere in the scene and more easily monitor its behavior. The rigid-body mass of the sphere is increased by a factor of 10 each time a user taps the sphere. You can see the result in Figure 4, where the turret's capsule fire doesn't move a large sphere that has been tapped two or three times, although the other spheres are easily moved. Figure 4. Capsule fire doesn't move a sphere that has increased scale and mass. This script is simple: the sphere's mass and scale change discretely as the result of a received Tap Gesture.. In a more complex gaming environment, a Tap Gesture may initiate a sequence of events where mass and scale increase over time and in response to other elements in the simulation. Another possible enhancement is to use the Time.deltaTime method to configure a gesture sequence to reduce mass and scale by applying double taps. This functionality may be useful in a shooting-type game, where projectiles' velocities can increase, resulting in a varying impact effect. Also in a shooting-type game, you could configure this functionality as a defense mechanism whereby a user press or release would reduce velocity and lessen an impact effect. You could also use it in a Tetris*-style game to increase point rewards as the velocity of the puzzle pieces increases. I used the gestures demonstrated in this article to manipulate a Unity 3D asset's position, scale, mass, and forward velocity. Other rigid-body parameters that are good candidates for touch gesture manipulation are angular velocity, drag, and center of mass. You can tie these rigid-body parameters, which are altered by touch gestures, to existing parameters, such as color and texture. There is also the potential to create custom variables for a rigid-body physics simulation. One example is a hitDamage variable that increases every time the user taps it, with a certain amount of health subtracted from the object it hits when a collision is detected. I built and executed the rigid-body physics example developed in this article with Unity 3D running Windows 8 on an Ultrabook™ device. I tuned the maximum lifetime of turret projectiles and spawned spheres for that platform and provided a simulation that responded as expected to the programmed touch gestures. Asset lifetime is just one of the parameters you must keep in mind when altering asset physics attributes. Take care to prevent a user from being able to put the physics simulation in a state where the entire application's performance and response are degraded. A basic preventative measure is to cap the minimums and maximums of the physics attributes being altered. By keeping performance issues in mind, Windows 8 running on Ultrabook devices provides a viable platform for developing Unity 3D simulations that alter attributes of scene assets in physics simulations.